I've been reading this forum and everyone seems so nice and helpful! I am looking forward to participating. I've started researching my husbands family back to where they came over from Italy to the states. I've been told by my father-in-law that it will be a miracle if I can find any records from Italy as his family was told they were all destroyed during World War II. However, he also doesn't know tons of information about his family and so I'm on a mission to find out more and prove him wrong by in fact finding Italian records. Here is the family information that I know. This is the generation that came over from Calabria, Italy. It is widely known that the family is from Calabria, Italy and they came to the states because supposedly Dominic Surace, Sr didn't like Italy and wanted to cut ties with his Italian roots by Americanizing his family as much as possible. The family individuals went by different names during their lives, they each seem to have an Italian Name and their American Name. Domenico = Dominic, Fravia (also been seen as Flavia)=Mary, Nunziata=Nancy. Domenico Jr = Dominic Jr., James = Vincenzo. On a death certificate of Dominic Surace it lists his parents names as "Louis Surace" and maiden name of his mother as "Grace?" with their birth places being Italy. Hey Kelly and welcome to Gente! I believe the ship manifest document looks like it references a comune in Reggio Calabria called Sant'Eufemia d'Aspromonte. I wonder what others here think about that? If it is the case, the civil records for the town from 1810-1910 were microfilmed by the LDS church and can be ordered and viewed at your local family history center. What does everyone else think? Hope that helps! Thanks so much for your help! This is exactly what an Italian genealogy group on Facebook decided as well (As to the location). So how does it work to view information at the Family Search Centers? I've never gone and I'm not sure exactly what I will be looking for. My understanding is that I will need to order the films to view and that they have limited hours. Will I be able to print copies for a fee? I'm assuming all of the records will be in Italian, so is there anywhere on the web that can give me an idea of what I will be looking at and what the certificates and words mean? I do not speak any Italian and am not exactly sure what I will be looking for! First off, don't get too nervous over the script in the documents. Yes, granted there are many times we have all wanted to smack the clerk, mayor, or priest who was doing the writing, however you pick it up quickly. Often times, there are forms which were filled out for each event. You will learn, quickly, the key terms and things to look for. Any rough patches you have, feel free to post the image here and we can help you translate. Now, as for the Family History Center, you will have to find whichever is closest or best for you. The hours for each center vary, so you want to pick the one which fits your schedule best. I would also call or visit ahead and see if the center has a Digital Scanner/Reader which will allow you to copy images to a thumb drive and view them at home. If not, you can make hard copies at about a quarter each, but taking pictures with a digital camera works also. They will also be able to guide you in the right direction and help you through the ordering process. You really want to get numbers down for dates and ages, as well as an idea of basic professions. Baby steps to start, and you will be running quickly! Don't be afraid! It might seem daunting now, but it is an adventure so worth it in the end. ahhh great information! So, am I correct that I will pay for each film I order (which has it's own file number) and you can only order so many at one time? If this is the case, I'm having a hard time deciding which films to order first. All the information above is what I know about the family going back to the last residence of the mother and father of that generation. I know a possible name of the Dominic Surace, Sr's father and mother - his death certificate lists them as Louis Surace and Grace? 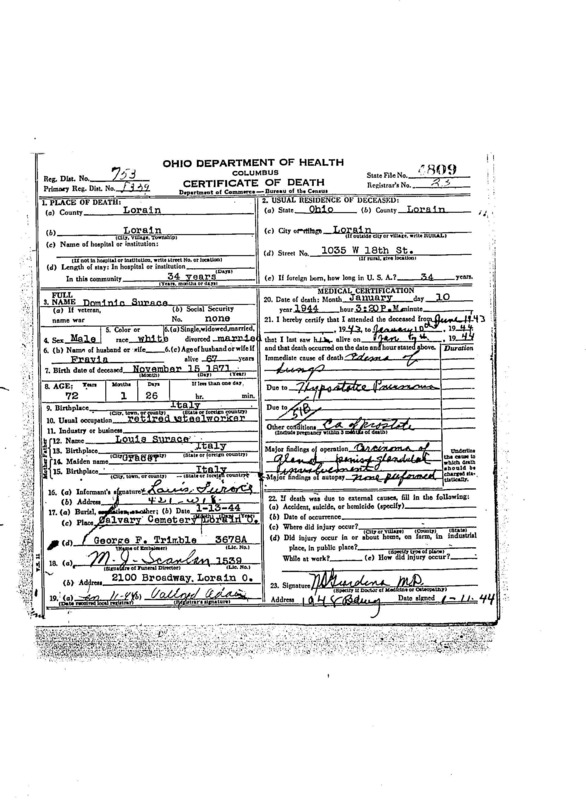 (link to image of death certificate: farm6.staticflickr.com...b562_o.jpg ). I'm not sure if this couple was married in that town, or even if their children were born there. I'm only assuming they were at this point as I have no other idea of where to search locality wise besides this. All documents I have found so far in the states for them list Reggio Calabria or Italy as where they are from, this is the only Comune i have found listed anywhere. So, do I search first for possible birth records? Christening? Marriage? Just wondering which might be easier to find or which might give me more information to keep digging and finding more info. Thank you again for all of your help and suggestions! You are right. You have t pay for each film, and prices range depending on how long you want the film, though I think you can order as many as you want. I would start with Film # 1963434 which contains birth records for the years 1868-1880. That would cover the year of Domenic's birth. While there is no guarantee that this will be the right comune, it is your best bet. Should you find a records that fits with what you know, you can order additional films from there. The next thing I would look for is marriage records for Domenic and for his parents, but that should come second because you have a tentative birth date. So would it not be smarter to start with the birth of Domenico and Fravia's children who were born closest to the time of Domenico coming over on the boat to Ellis Island? Would their children;s birth or baptism records give any information that would help document the family on back to possibly the birth city of the parents? I'm jut thinking that starting with the closest dates to the time I knew they were in that city might make more sense, unless those records would be of little help with the information that they provide (I don't know what information all of the forms actually have on them). Thanks again for your help and suggestions! You sure can go for the birth records of the kids, as it is always good to start with what you know and go backwards. Generally, you will find the age of the parents and their occupations and residence on a birth record, and you might find the names of the grandfather's as well, but that can be hit or miss. It wouldn't tell you if the parents were born in another town, but you could find that information on a marriage record. If you have an approximate marriage date, you could always order that film and see what you can find. Marriage records happen to be my favorite! Usually, families at that time didn't move much, so I would think it a safe bet that the family was from the town on the manifest for a generation or two at least. In my case, it doesn't seem my family left the town much at all in 400 years! My thinking would be to try and find either the marriage of Domenico and Flavia or their birth acts to link you with the comune and take you back a further generation. If you order the film for their children's births (which you would want to do at some point anyway) you won't get as much new information, but you will confirm what you know from your American records. It is really up to you, but I will say this, if you do find they did come from this comune, you will eventually order every film...trust me! Haha.